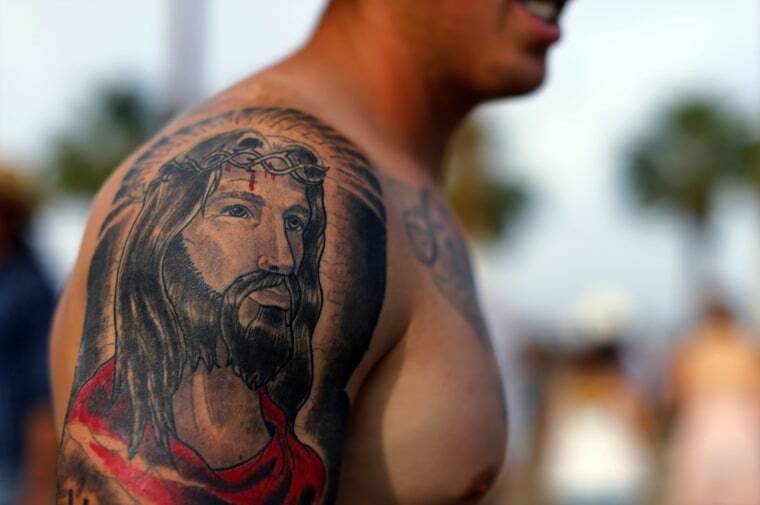 Guess how tattoos stay there forever, even as your skin cells die and are replaced? French researchers say they have found the answer, and it’s a little bit surprising. They found that immune system cells called macrophages eat the ink, and then pass it to their replacements when they die. So the tattoo ink doesn’t stain skin cells, as many people had believed. Instead, microscopic blobs of ink are passed along from one generation of macrophages to another, according to the report in the Journal of Experimental Medicine. “We further demonstrated that tattoo pigment particles can undergo successive cycles of capture–release–recapture without any tattoo vanishing,” Anna Baranska of the French research institute INSERM in Marseille and colleagues wrote. They were doing experiments aimed at understanding the action of immune cells in the skin of mice. They created genetically engineered mice whose macrophages could be killed easily, and were monitoring how and when they were replaced by new macrophages. They used tattoos in the mice tails to track this. Researchers have known that immune system cells are involved in helping the body take up tattoos. The ink doesn’t simply stain skin cells, because these cells die over the years and are replaced. But it was assumed that the ink was staining skin cells called fibroblasts, which make up the connective tissue, and that the ink was continually replaced by macrophages. Instead, the French team found that macrophages took up the ink, released it when they died, and that fresh macrophages then gobbled it. “We demonstrated that the pigment particles that remain at the site of injection and cause the long-term tattoo color were exclusively found within dermal macrophages,” they wrote. They found no colored fibroblasts. It’s not surprising that macrophages might be involved in this process. The name comes from the Greek for "big eater.” It’s their job to eat outside invaders. “Owing to their strategic positioning at body barriers, macrophages capture a wide range of exogenous (outside) particulates,” Baranska and colleagues wrote. Their findings may open a better way to remove tattoos, they said. Lasers can be used to take off unwanted tattoos by activating other immune cells that carry the ink away. But it can be a less-than-perfect process, depending on the type of ink used. Dermal macrophages don’t move around the body like some other immune cells do, so the trick may be to activate other immune system cells that can grab the ink and take it off to the lymph nodes, to be carried off in lymph fluid. Some kind of trick to kill off the ink-noshing macrophages for a while, so that other immune cells can take away the ink, may be the secret, they said.